Writing down step-by-step processes for sales, installation, scheduling/delivery, service, remote service communication, proposal generation and more will boost profits. Mapping out your business processes is not necessarily about creating a guide for hiring new employees, but a technique for maximizing profit. Process, process, process is the name of the game these days among integrators. The more honed your business processes are the more efficient your operation is (and the more profit you make). Yet, many integrators likely don't have any of their business processes written down. According to Paul Starkey, principal at Vital Mgmt., a consulting firm serving the custom electronics industry, 70 percent of custom integration companies with more than 10 employees claim they have a written financial documentation process. "Based on my experience... that is just not true," he says emphatically. Starkey, along with his partner Steve Firszt, presented a session at the recent CE Pro Summit in Pittsburgh that focused on creating business processes. "If you have a good process and remove one step, it usually breaks the process down." — Paul Starkey, Vital Mgmt. Starkey reminds dealers that processes are not about how to add new employees, but more importantly about how to make your salespeople and technicians more productive. “Process is a team sport. It is not a situation like the 10 Commandments where you generate them and take them to the employee base and announce, ‘Here is our new process,'" he says. Just by definition, a process is a series of sequential steps that has a start and a finish. Each output in a process is an input into the next step. Processes are not static. They continually improve. "If you have a good process and remove one step, it usually breaks the process down," he adds. Client duties are often left off of many dealers’ process charts, but it should not be, advises Starkey, because the client does need to do things for a project to be completed. And often, the client is an integrator's biggest variable because they can throw curveballs at you and the project. 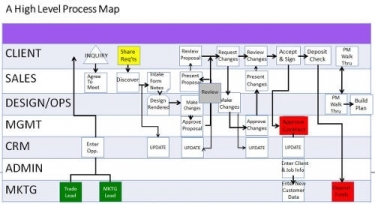 “Flowcharts the most common way to document your process, but you can Google 'process documentation' and you find multiple methods of documenting a process," he notes, saying step charts are also common. But how many processes do you actually need to document? Lots. "It’s messy and overwhelming, which is why many companies just don’t do it," comments Starkey. Which Process Documentation Makes the Most Impact? What does process documentation look like and how granular should an integrator get? “There is lots of room for improvement in scheduling and logistics. How much productivity is lost because they get to the jobsite and there just isn’t the documentation they need. That leads to hallway conversations that lead to radical changes and misunderstandings among salespeople and installers," says Starkey.